The following article appeared in the Welwyn Times on 5 June 1941, page 5. Dudley Sandy Garton Honor was born, to British parents, on September 5 1913 at Quilmes, Buenos Aires, Argentina, where he was educated. He was brought up speaking better Spanish than English. He joined the RAF on a short service commission in July 1937 and after training as a pilot joined No 88 Squadron at Boscombe Down. No 88 squadron was equipped with the Battle light bomber and went to France at the outbreak of the war with the Advanced Air Striking Force. In May 1940 the outdated and inferior Battle squadrons were thrown against the German airforce with the RAF suffered appalling losses. Honor flew reconnaissance and attack sorties against the advancing German columns and dive-bombed the bridges over the Meuse. He was one of the few pilots of his squadron to survive and escape back to England. He was later awarded the Distinguished Flying Cross (DFC) for his services in France. The Battle of Britain opened in July 1940 and the RAF was short of pilots, Honor volunteered to fly Hurricanes. He had no previous experience as a fighter pilot, but was sent to No 145 Squadron off Scotland. The squadron was transferred to the south where he was forced to crash land in Sussex after a running battle with a Messerschmitt, his Hurricane was written off. After a spell on night-fighting duties he was sent to the Middle East. In January 1941, he ferried his single-engine aircraft across the desert over Nigeria, Chad and the Sudan to Egypt where he joined No 274 as a flight commander. Honor had soon shot down a Messerschmitt over Tobruk, shortly after the German fighters had made their debut in North Africa. On May 15 1941, the British forces launched Operation Battleaxe and Honor and his pilots were in constant action. He shot down another Messerschmitt and damaged three others. However, most of his action was attacking enemy motor transports and fuel and ammunition dumps. Honor’s unit, No 274 Squadron flying Hurricanes, was sent to Crete in the middle of May 1941 in an endeavour to stem the German landings.On May 25 he and another aircraft were tasked to attack the German-held airfield at Maleme. As he approached he saw many Italian and German transport aircraft preparing to land. Ignoring the dense flak, he attacked and within a few minutes he had shot down two of the transports. As he broke away from the enemy airfield German fighters chased him. His aircraft was badly damaged and became difficult to control. He managed to evade further attacks before his engine stopped, he was then forced to ditch into the sea. His plane hit the water with the hood of the cockpit still closed. His Hurricane sank to 40 feet before he was able to escape, his German lifejacket – obtained during his service in France – inflated immediately and he surfaced. During his swim he jettisoned his trousers, the rest of his clothes being very wet, he managed to dry them out the following day before continuing his journey south. After a night in a church and another night in a goatherders hut, he came upon a small village. Someboys came to meet him and guided him to the nearby church where the padre gave him food and water and a pair of trousers. The padre told him of another British pilot that had been shot down that day, he turned out to be a sergeant from his own flight. The villagers then started a friendly discussion as to whether to turn them in as they were surrounded by the enemy, six villagers had already been shot for supposedly withholding information. Both pilots decided to attempt to find there way through enemy lines, after a meal of Egg and Chips they left. At dusk they came across enemy aircraft attacking a nearby aerodrome and they heard an aircraft approaching, which turned out to be a British Sunderland. Using their torches Honor and his sergeant signalled “RAF here, RAF here”, with a million to one chance of them being spotted. The pilot of the Sunderland did spot them and managed to land and take off with the British pilots safely onboard. On 1 March 1942 he was made Temporary Squadron Leader, which was made permanant on 4 May 1942. Honor took command of No 274 in August, and four months later was promoted to wing commander to lead No 258 Wing in operations over the desert. 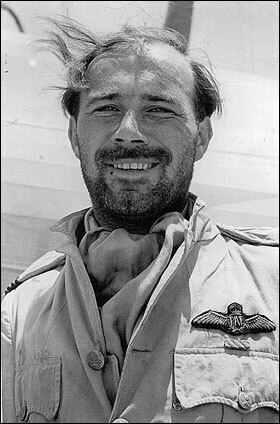 He achieved his final success in December when he shot down an Italian fighter near Tobruk. He served on the fighter operations staff in Malta before landing in Sicily and then in Italy. Honor returned to England in 1944 before going overseas as the Air Attaché in South America, covering Colombia, Venezuela and Ecuador. He was promoted to group captain in 1946 but resigned his commission a year later to become 1st UK Civil Air Attaché accredited to Argentina, Uruguay, Chile, Bolivia and Brazil. In 1951 Honor became director, Latin America, of the Bristol Aeroplane Company. In 1960 he became Canadair’s director in the region before becoming the manager of Air Canada, South America. In retirement Honor and his second wife, Mary, moved initially to Canada, where they were given Canadian citizenship, but in 1973 they moved to Spain, where they started to grow lettuces. Honor introduced new varieties to the region and was dubbed the “Lettuce King of Andalusia”. In 1990 they moved to England, settling in Devon. Dudley Honor died on December 26 2007 at the age of 94, he was twice married. With his first wife, Jill (née Elgie), he had a daughter, who survives him. He is also survived by his second wife. 2018.March 5 – Googled Dudley Honor and found this page. My family knew he and Mary personally for years. My father flew with him in Squadron 274 – he was with the RCAF and was in the Middle East with Dudley. Their lives and where they lived criss-crossed for decades from South and Central America to Montreal and New York. Mary and Dudley were like godparents to me. I’d like to be put in touch with the author, Susan Hall, please.